Title: 03/04/1985 - Position on MSDS format for compliance with the Hazard Communication standard. This is in response to your letter of February 11 requesting information on the adequacy of your firm's planned MSDS format for compliance with the OSHA Hazard Communication and Labelling standard. To begin with, the regulatory philosophy of the Reagan Administration is to provide the business community with maximum flexibility with respect to how compliance with regulatory objectives is achieved. Toward that end, OSHA is phasing out the use of the Form 20 which previously served as a format for MSDS sheets. We are not planning to prescribe any fixed format, nor are we in a position to review and approve the formats selected by the various companies required to issue MSDS's pursuant to the Hazard Communication standard. However, the standard requires chemical manufacturers and importers to develop an MSDS for each hazardous chemical they produce (or if they are US importers) for products they import. These must be supplied, updated, and provided to purchasers in SIC codes 20-39 which comprises the manufacturing sector. We in OSHA appreciate the care and concern your firm has evidenced in preparing to work with us to implement this important standard. I hope this information will prove helpful to you. If you have any additional specific concerns about the Hazard Communication and Labelling standard you can direct them to our staff expert on this subject Ms. Jennifer Silk, phone (202) 523-7166, mailing address Room N3636, 200 Constitution Avenue, N.W., Washington, D.C. 20210. 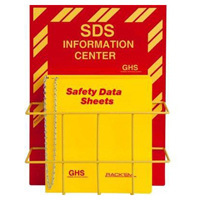 As per our recent telephone conversation, please find enclosed a copy of our current Material Safety Data Sheet which we use for our products in Canada. Could you please review our MSDS format and let me know if it will comply with the OSHA requirements that are scheduled for November, 1985. If the format does meet the MSDS requirements, we intend to use this sheet to accompany product shipments to the U.S. I would appreciate your comments in writing if possible. My business card is enclosed if immediate contact is required. Thank you for your concerns on this matter. 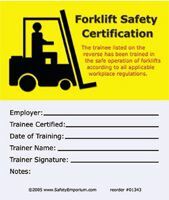 Get forklift safety supplies like this training certification card from Safety Emporium.